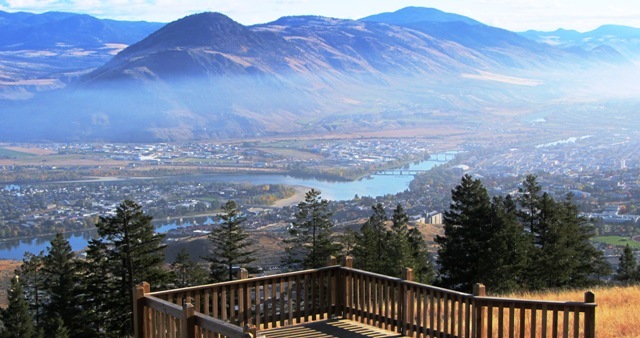 Kamloops is world famous for its great hiking and mountain biking trails. Come see for yourself why the world just can't get enough of our incredible city tucked amongst numerous lakes and rivers in the Southern Interior of British Columbia. This short 30-40 minute round trip hike straight up a gravel road brings you to the most beautiful view of Kamloops. A lookout with benches, a park bench and a picnic table offer people a place to sit down and enjoy the view. 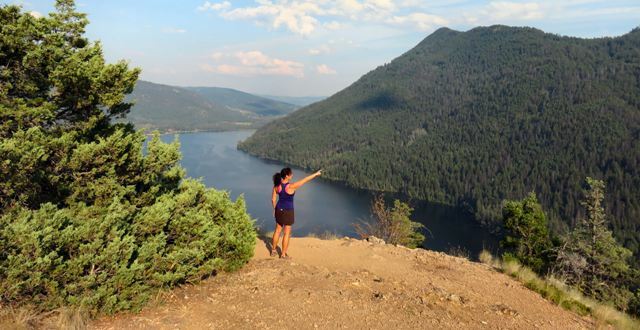 This short 30-40 minute round trip hike is conveniently located right in downtown Kamloops. The last part is very rugged and you are at your own risk. Depending on the water level you may have to cross the creek to get to the falls. There is a large walk in cave along the trail that is super-creepy! This 6-kilometer round trip hike through some of the Lac du Bois grasslands makes a great family hike. The tiny Deep Lake is the reward at the end of this trail that starts in Westsyde. This beautiful 4 kilometer trail circles McConnell lake taking about 1.5 hours. There are plenty of resting areas along the trail as well as a number of small wooden bridges crossing over tiny streams. Just a short drive down the Lac le Juene road, this is a great hike year round. You can't miss the silt bluffs as you drive into Kamloops on the East Trans Canada Highway, but have you ever taken the time to explore them? If you do you will discover arches, sink holes and all sorts of birds and other wildlife along with breath taking views of the South Thompson River. Not only do these trails offer great views of the Heffley Lakes, they are also home to Alligator Lizards...yes, we have lizards in the loops! It is straight up hill so wear some good hiking boots and get in shape before taking this one on. This super awesome Lac du Bois trail brings you through hoodoos and an awesome narrow canyon while also providing a great view of Tranquille. There is also a great chance of a wildlife sighting as this is a popular place with mountain sheep. Located a short drive from town this is a favorite year round. Whether you park in the provincial park and take the short trail to the top of Gibraltar Rock or park by the dam and take the long route along the lake you will get a great workout along with a great view. This trail has everything. Not only do you get a little history by walking past two old abandoned cars and some old telegraph lines, there are also mountain sheep and other wildlife along the trail and three view points with breath taking views of Kamloops Lake. This is one of Kamloops' best kept secrets. The well maintained trail around Isobel Lake is maintained by the school board and has some great informational signs along the way. Not only is it a great place to bird watch, parts of it are wheel chair accessible and there are some great picnic locations! ​Update: The Kamloops Thompson Trails Alliance has recently completed an accessible trail of 3.1 km around the lake. They raised over $80,000 and with the help of our many sponsors and volunteers completed the project after 6 years of dedicated work. They held the Grand Opening on June 01. Be sure to check out the new trail and facilities such as rest benches, picnic tables and signage.